According to the Guardian, Cityscoot has been testing 50 of the scooters since last June with the support of city authorities and the results had been “very positive”, the mayor’s office said. “In the last three months 1,200 testers have completed nearly 4,500 journeys,” the office said, adding that 65% of those who took part said they would use the scheme regularly. We’re obviously big fans of the idea although we imagine that having looked at the video below, riders will want to bring along their own helmet. You also have to wonder how costly it would have been to retrofit the Velibs with Electric motors. 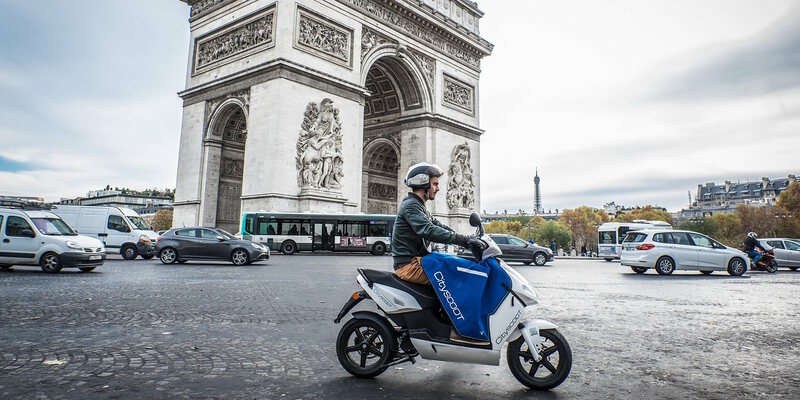 There are now going to be 3 types of Vehicle rental stations around Paris. The upside is that not only will it take petrol scooters off the street, but it will also reduce the noise level of the city – which is a big plus. Cafe-goers will certainly appreciate the reprieve from the noisy and stinky scooters that currently litter the city.